The city of temples receives the Lord of the Universe! Jammu 9th November '2010 - The Rajdhani express brought the Lord of the Universe, Jagannath Dev alongwith His brother Baladeva and sister Subhadhra! Devotees of GOKUL, welcomed their Lordships with Kirtan chants of Jai Baladeva, Jai Subhadhra, Jai Jagannath, Jai Sudarshan! Under the guidance of His Divine Grace Srila Bhakti Ballabh Tirtha goswami maharaj, a grand temple of Bhagwan Shri Jagannath dev is being established for the first time in Jammu, where we have all but no Jagannth temple till date. The great kings and saints of Jammu constructed big temples, but no one thought of having a Jagannath Mandir here for reasons known to the Lord only. 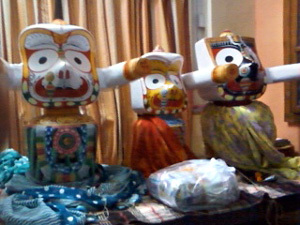 Three very beautiful deities of Baladeva, Subhadhra and Jagannath have arrived today amidst Shankh-naad and Dhol Nagare! The deities were reverentially taken in a procession, the first Rath-yatra, around the city with bells ringing. From Railway station to Shastri Nagar, people were overcome by the ecstasy of the devotion. A welcome arti was performed followed by the distribution of Laddu Prasad! An air of sea shore of Puri touched Jammu city for the first time. GOKUL is now organising prabhat pheries and Sankirtan programmes in the city to make public aware of the arrival of the Jagannath Dev. The Pran-Pratishtha ceremony is going to be grandly celebrated in January, 2011. Many saints from all over India under the stewardship of Srila Bhakti Ballabh Tirtha Goswami Maharaj will take part in the grand instalation ceremony. The deities of Shri Chaitanya Mahaprabhu, Radha and Krishna will also be installed together with Jagannath Dev. Annual Rath-yatra on the lines of Puri will be organesed every year. People in Jammu were anxiously waiting for Jagannath Dev.